I recently picked up a copy of Journey at a local used bookstore and looked forward to reading it. Upon finishing Bleak House (Yes! I did it!) I reached for the shortest, easy-to-read book I could find and Journey was at the top of my pile! A quick 83-page book, sweet and simple story and about 40 minutes of my time (max) re-convinced me that I am a fast reader and can get through books, provided that they are not 820 pages, of course. "It was clear to me that much of the focus of my writing was sharpened by my involvement and concern for families and children. This interest, coupled with my commitment to children's literature, provided the basis for my decision to write for children--something I had always wanted to do." Her works of fiction are geared towards children. Amazon lists Journey as being appropriate for kindergarten readers on up and while that may be (sadly) true in today's society, I think I would suggest this to ages 8 or 9 on up. The topic of Journey is much like that of Baby - child abandonment. In this book we meet Journey, an eleven year old boy who lives with his grandparents and his sister, Cat, after their mother leaves them. The book opens with his mother making her goodbyes and the rest of the book deals with Journey's adjustment to his new life situation. While this topic is dark and somewhat hard to take, just like I mentioned when discussing Baby, MacLachlan handles the topic beautifully. She is sensitive and real, I think, without allowing any of her characters to fall into a pit of self pity and stay there. 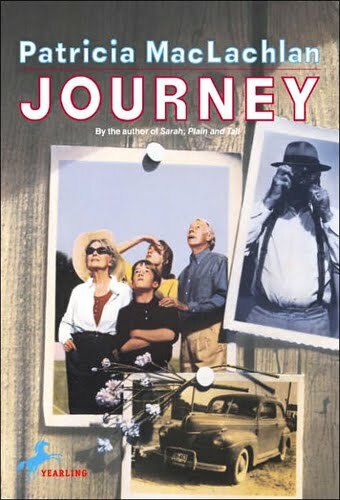 In the case of this particular book, Journey's grandfather plays a major role in helping his grandson adjust to life without his mother by taking pictures and building a new history and a new memories for the young boy. It is very clear that Journey's grandfather suffers from his own wounds but he is aware of the fact that life is going to go on and that they need to find ways to be happy and pursue life despite the dramatic and awful situation that the family is facing. Journey's sister Cat undergoes her own transformation after her mother abandons her, but her reaction is more to throw herself into life and hard work than introspection. Cat is the original owner of the camera that Grandfather eventually takes possession of and puts back into use. Cat gave him the camera in one of her fits of cleanliness. "I've given up the camera," she yelled, her head underneath the bed, unearthing her life. "I've given up the flute and most everything else. Including meat,"she said pointedly. "I have spent the entire afternoon looking into the eyes of a cow, and have become a vegetarian." "Which cow?" asked my grandmother, not kidding. Grandfather seems to always and forever be taking pictures of his little family. This both amuses and annoys Grandma, Cat and Journey. (Mostly, it annoys Journey until he discovers the beauty of photography.) The family was loading up in the car to go to town. He makes Grandma come out of the house to pretend she is going to town too. "Get a hat, Lottie, he calls to her. Grandma puts on her straw hat with the cloth strawberries and grumbles all the way down the path to the car. "Look fetching, Lottie," he tells Grandma as he leans down to peer through the camera. "I'm not an actress, Marcus," says Grandma sharply. "I am a hot, old woman." "You are a fetching old, hold woman," says Grandfather, making Grandma laugh. The entire plot of the book revolves around family photographs - ones that once existed and the ones which are being created as the story moves along. Being a wedding photographer, I naturally connected to the discussion of the importance of photos. As MacLachlan makes a point of saying through her characters, photographs reveal truths to us - things that are in the moment and sometimes things which are going on behind-the-scenes. Photographs - good ones - evoke emotions. They remind us who we are, who we've been and where we are going. They preserve memories of good times and bad ones and so I liked the emphasis on the importance of family photos. We have Caleb's Story and Sarah. I don't know why it never occurred to em to read Sarah, Plain and Tall. I loved the film with Glenn Close. This sounds neat, Love Grandpa's bantering with Grandma. Sometimes a smaller book is just what is needed after a long one. A friend of mine got me all of the Sarah Plain and Tall series; I love the first one, but haven't read the rest. I didn't realize MacLachlan had written so many other books, but now I have even more to put on my "to read" list! Thanks for this! I LOVED Sarah Plain and Tall when I was younger, but until recently I hadn't even thought to see if she had any other books. Sounds like a wonderful book. I love the photography theme, since I am constantly taking pics of my kids. Do you think this would be appropriate for a 9 yr old boy with advanced reading skills? I'm thinking over my kids' reading lists for this fall and this sounds good for my oldest. @Stephanie's Mommy Brain - Yes! I think it would be a good read for him. Certainly appropriate at that point.